Ancient Aztecs discovered the phenomenal flavors of blending sweet cocoa with spicy peppers. 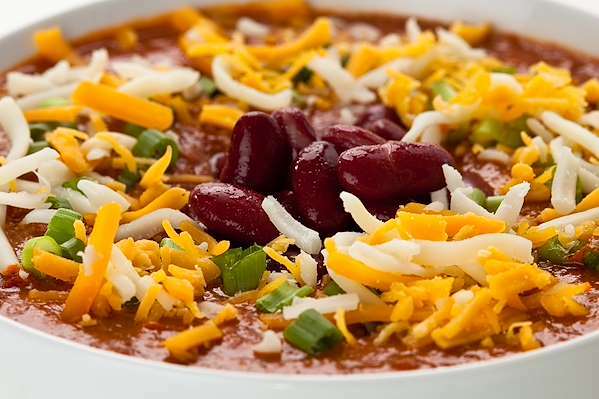 My yummy chili recipe capitalizes on the idea with tender beef, beans, onions, and tomatoes. Dark cocoa, chocolate, and chocolate beer provide the bitter-sweet nuances while the chilies bring on the heat. RecipeSavants.com Ancient Aztecs discovered the phenomenal flavors of blending sweet cocoa with spicy peppers. My yummy chili recipe capitalizes on the idea with tender beef, beans, onions, and tomatoes. Dark cocoa, chocolate, and chocolate beer provide the bitter-sweet nuances while the chilies bring on the heat. Smart Recipes, Fusion Recipes, Beans,Beef Recipes, Recipes Beans,Beef Fusion Chocolate & Chipotle Chili PT3H55M Serves 8 Ingredients: 0.25 Pound Dried Pinto Beans 0.25 Pound Dried Black Beans 6 Cups Water 1 Bay Leaf 2 Medium Chipotle Chilies 1 Medium Dried Ancho Chili 1 Pound Ground Beef 2 Teaspoons Salt & Freshly Ground Black Pepper 0.25 Cup Extra-Virgin Olive Oil 4 Cloves Garlic 2 Large White Onions 6 Ounces Tomato Paste 15 Ounces Crushed Tomatoes 12 Ounces Chocolate Stout 1.5 Tablespoons Brown Sugar 2 Cups Chicken Stock 1 Small Lime 0.25 Cup Fresh Cilantro Leaves 0.25 Pound Dark Chocolate 3 Tablespoons Dark Cocoa 2 Teaspoons Dried Oregano 1 Tablespoon Ground Cumin 1 Teaspoon Paprika 0.5 Teaspoon Ground Cinnamon In a 6-quart Dutch oven over medium-high heat, combine the water, beans & bay leaf and bring to a boil, and reduce to a simmer for 90 minutes, or until tender. Drain and set aside. Meanwhile, rehydrate the chilies in 2 cups of boiling water for 20 minutes. Drain and reserve 1/2 cup of the liquid. In the bowl of a food processor, combine the rehydrated chilies, reserved cooking liquid, lime juice, and cocoa chili powder, and puree into a smooth sauce. Puree into a smooth sauce. Heat the oil in the Dutch oven over medium-high heat, and brown the ground beef for about 5 minutes. Stir in the minced garlic, diced onions, 1 teaspoon of salt & pepper and saute for 5 minutes. Stir in the tomato paste and saute for another 2 minutes. Add the cooked beans, chili sauce, tomatoes, beer, sugar, and stock; bring to boil, and reduce to a simmer for an hour. In the last 30 minutes, stir in the dark chocolate and the remaining salt & pepper. Serve in large bowls, with a sprinkle of cheese and green onions if desired. 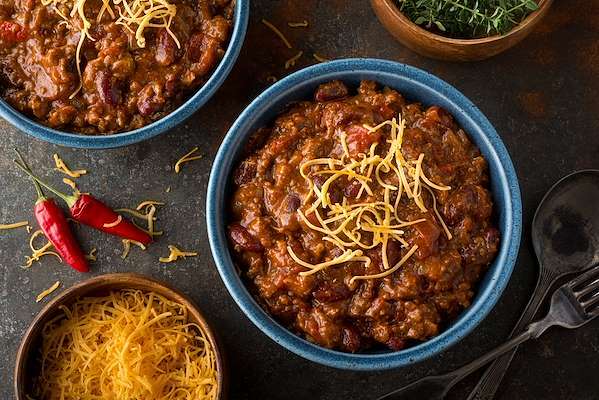 If you enjoyed this easy chili recipe, you'll love these fresh ideas!